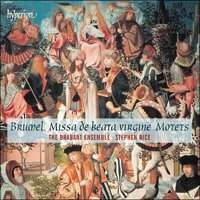 The disc is completed with a selection of Brumel’s motets, among which particular mention goes to the expansive Christmas piece Nato canunt omnia, with its echoes of Johannes Regis in the previous generation. It receives a bright, lithe performance whose translucent tone nearly conceals impressive vocal dexterity. In marked contrast to it is the tranquil Beata es, Maria, which may incidentally have formed part of another musical competition (settings by Compere and Obrecht are very similar in design). The Brabants have never ventured this early before but on this showing I hope very much that they will do so again.